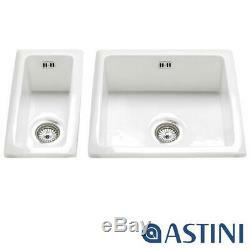 Astini Hampton 150 1.5 Bowl White Ceramic Undermount Kitchen Sink & Chrome Waste. Length (Left to Right) - 250mm. Width (Front to Back) - 475mm. Depth (Top to Bottom) - 180mm. 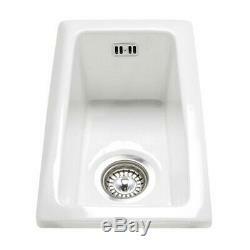 Main Bowl Size (Length x Width x Depth) - 450mm x 475mm x 215mm. Second Bowl Size (Length x Width x Depth) - 250mm x 475mm x 155mm. Ceramic sinks are hand made in the traditional fashion, using the same craftmanship as 100 years ago and due to this process the sizes may vary +/-2% from those shown and may not be exactly uniform. 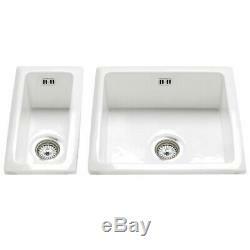 Sink Orientation - Fully Reversible. 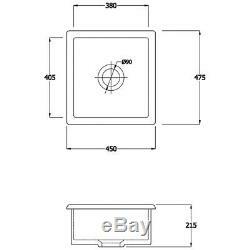 This item can be fitted with the features on the left or right hand side. Bowl Configuration - 1.5 bowl only. Waste Type - Basket strainer waste. Second Bowl Waste Type - Basket strainer waste. Suitable Plumbing Kit - Suitable for use with 2 bowl plumbing kit. Please note, a plumbing kit is the pipework that connects the sink waste plug to the discharge pipework to take the waste water away. Depending on the model of the plumbing kit, it also has spigots available to take appliance waste away, such as washing machines or dishwashers. Suitable For Waste Disposal - Yes. 15 Year guarantee against workmanship when used in normal domestic applications (excluding working and serviceable parts, abuse or neglect). 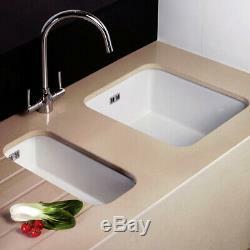 Large bowl ceramic kitchen sink. 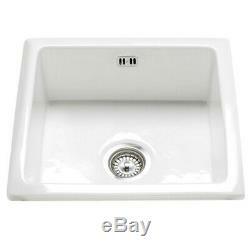 Small bowl ceramic kitchen sink. 90mm Basket strainer waste with removable basket strainer for easy debris removal for large bowl sink. 90mm Basket strainer waste with removable basket strainer for easy debris removal for small bowl sink. Square overflow waste kit for large bowl sink. Square overflow waste kit for small bowl sink. Please Note - The following items are not included. Plumbing kit with trap and connection pipework for the discharge from domestic appliances. Astini ceramic sinks are made from high quality, hard wearing and durable fireclay ceramic, resistant to everyday scratching, staining, denting and can also withstand very high temperatures so you dont need to worry about leaving hot pans. The glaze ensures a very smooth seamless finish, which prevents lime scale and dirt from building up making them easy to keep clean. The glaze are also resistant to chemicals so no need to worry about keeping household cleaning products away from them. Due to the smooth surface, germs are not keen to live on ceramic having no dimples, scratches to hide in, this makes all Astini ceramic sink very hygienic. This allows us to ensure that our customers receive a swift and quality assured service. Did you know we have over 17,000 square feet of warehousing? We have a 12,500 sq foot warehouse, for which we use as our main distribution warehouse, with a further 4500 sq foot in our overflow warehouse. Both warehouses are located in Bromsgrove, Worcestershire, in the heart of the country. Did you know we inspect every item before dispatch? All our orders are hand picked by our trained warehouse assistants and thoroughly inspected before dispatch. This ensures that our customers products reach them in pristine condition and in a timely manner. We understand that shopping online can be a bit of a risk when youre unable to check the quality of the item. Join our Newsletter for Offers & Promotions. Courier surcharge - Non UK mainland and Scottish Highlands. IV, HS, KA27 - KA28, KW, PA20 - PA49, PA60 - PA78, PH17 - PH26, PH30 - PH44, PH49 - PH50, ZE, BT, IM, GY, JE and TR21 - TR25. Courier surcharge conditions above, applies only to Medium & Large Items. International Customers - (Non UK). Courier surcharge conditions above, applies only to Medium & Large items. For Republic of Ireland, please also see "PandP and payments" section at the top each individual listing and update country drop down selector to Ireland. A contact telephone number is required before dispatch. Once your goods have been paid for in full, they will be dispatched in the following way. Medium & Large Items - Via Courier. Extra Large Items - Via Specialist Pallet / Transport Company. We DO NOT deliver "Extra Large Items" items to non UK mainland address and the following postcodes, please ignore surcharge information. IV, HS, KA27 - KA28, KW, PA20 - PA49, PA60 - PA78, PH17 - PH26, PH30 - PH44, PH49 - PH50, ZE, BT, IM, and TR21 - TR25. Shortage & Damage In Transit. All Goods delivered within UK and Ireland is insured against damage in transit. Please ensure all items are checked in full by your self. It is your responsibility to ensure that you are available to sign for your goods that you have ordered. 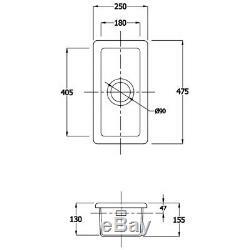 Utsumi UK Ltd T/As Taps UK Unit 2, Prior Wharf Waterside, Harris Business Park Hanbury Road, Stoke Prior Bromsgrove, Worcestershire B60 4FG, United Kingdom. We will advise you at this time of the availability of your newly chosen item, cost of redelivery, price difference and ways you can pay. Minimum 6 Month Product Guarantee (Unless Stated Longer). In the unlikely event that damage or a fault does occur, we will either. The more information you provide on the fault, the quicker we will be able to assist in resolving your query. Unfortunately, merely stating that a product is faulty is not sufficient for us to be able to act swiftly. This will delay us in providing a solution for you. It is most beneficial to us if you can submit photographic evidence with your message of the fault/damage. By doing so, this will void your guarantee. This is the most efficient way to solve the majority of issues. 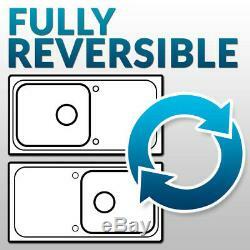 Should we request any parts or the original back from you, then we will cover any postal cost. Upon receipt we will process your item to be repaired. Once repaired, we will re-post your item back to you. The majority of repairs are very straightforward and can be solved without returning the goods to us. Returning the goods to us is a lengthily process and not advisable in most circumstances; however the option exists should it be relevant to take this route. Once a collection date has been agreed, our courier will collect the item between 8am - 6pm, unfortunately we are unable to advise you of a collection time. At this time we will advise you of availability, cost of redelivery, price difference and ways you can pay for your newly chosen item. We will then resend your preferred item to you within approximately 7 days of receipt. PLEASE NOTE: WE DO NOT OFFER COMPENSATION OR COVER 3RD PARTY COSTS IN ANY WAY. The item "Astini Hampton 150 1.5 Bowl White Ceramic Undermount Kitchen Sink & Waste Set" is in sale since Tuesday, August 2, 2016. 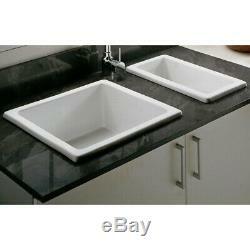 This item is in the category "Home, Furniture & DIY\Kitchen Plumbing & Fittings\Kitchen Sinks without Taps". The seller is "tapsukstore" and is located in Bromsgrove. This item can be shipped to United Kingdom.